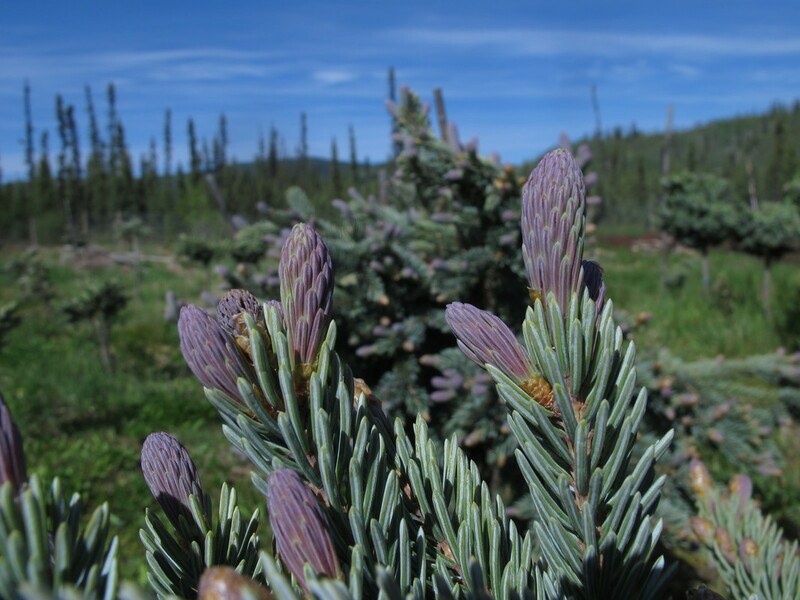 The boreal forest inspires our stunning conifer collections. 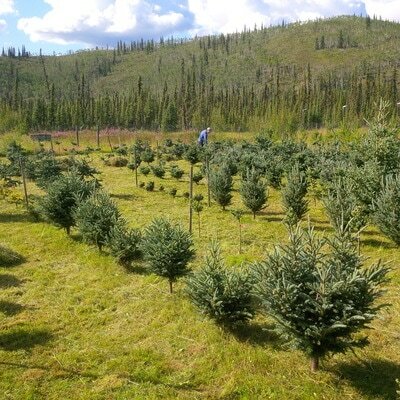 The most northerly nursery in Canada is pleased to offer a selection of conifers cut from the fabric of the boreal forest and crafted into unique feature specimens offered nowhere else. 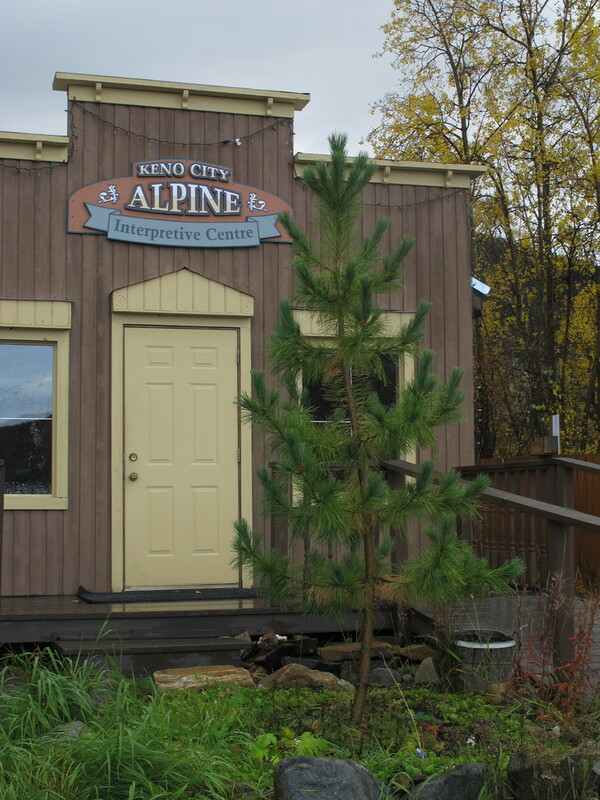 Visit our plantings around historic Keno. Questions? E-mail us or call us at (867) 334-0632. Each of these lines exclusive to our nursery can be traced back to a parent in the Yukon wilds. 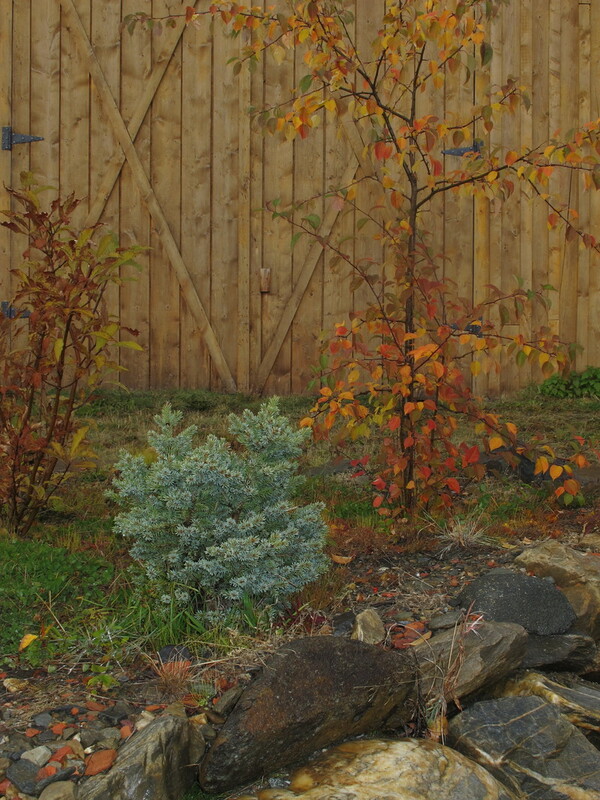 Together, they represent the diversity, beauty and ruggedness of the Yukon. Perfectly suited to conditions in all Yukon communities, they do not thrive further south - their stories only resonate in the land of their Origin. 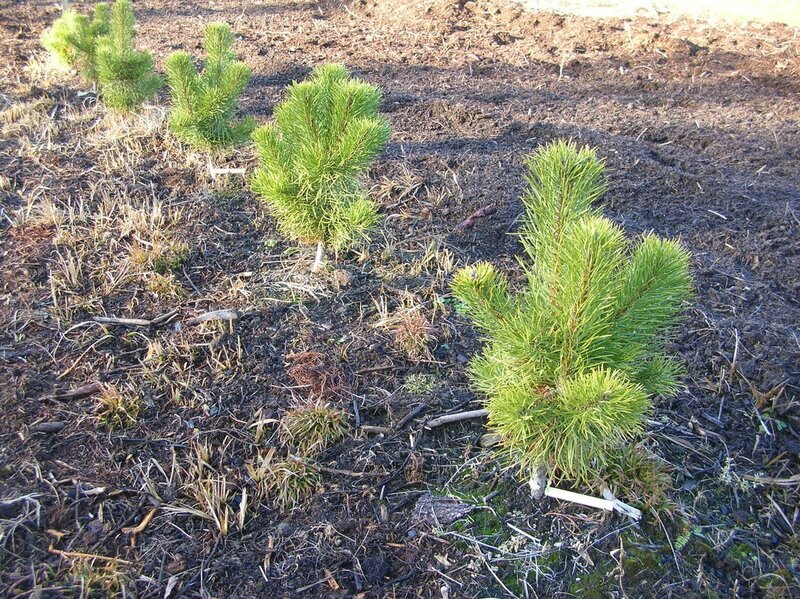 Growing Tip: Once established will withstand some drought, but retain needles and grow best kept moist on well-drained sites. Dwarfs may be container-grown if watered regularly. 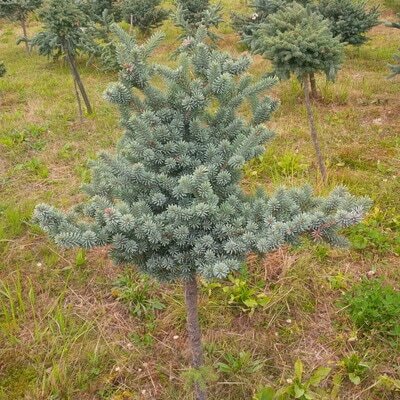 Coming Soon A splendid semi-dwarf with variable form; low and bunching on dry soil or with a stiff upright trunk, strongly horizontal branches and short dense branchlets clustered all round on wetter ground. 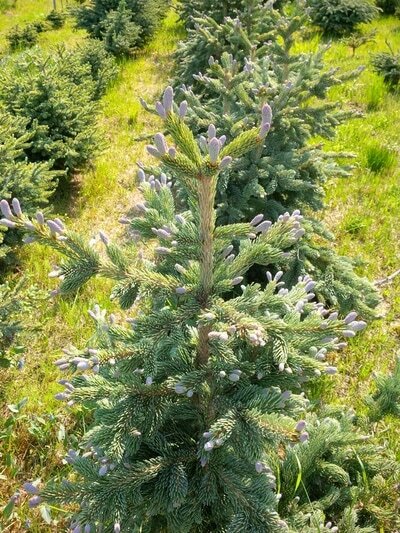 Arctic Crown has exceptionally heavy, long, curved, blue-green needles, concealing buds that break out in the spring in shades of purple to rose - a very showy tree. Grows 7 to 18 cm a year. 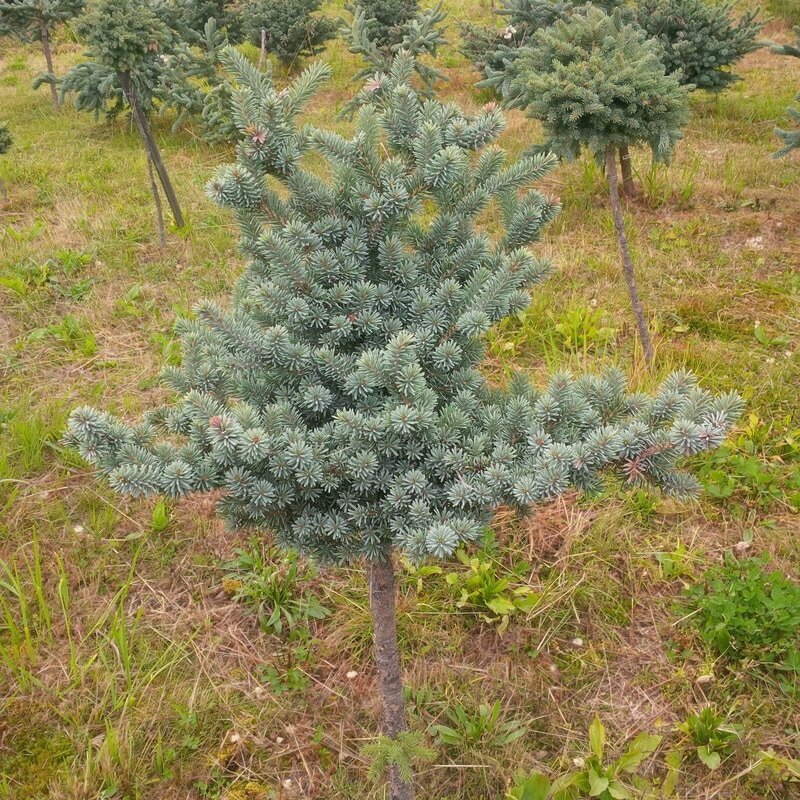 Responds well to pruning top (apical) shoots, becoming more dense. More dwarf on a standard. Use as a feature specimen or in a group. Discovered in the Klondike valley. A chameleon of a tree. 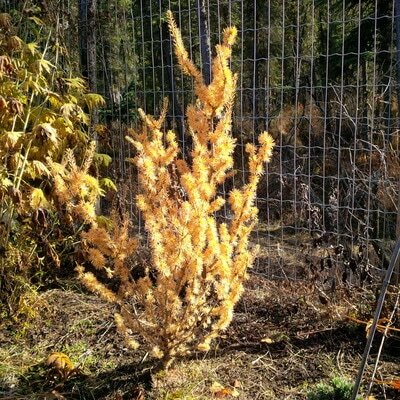 In bright sun a bronze/gold-needled dwarf that will sunburn if fully exposed, in a shaded garden it sports pale sea-green needles. Open graceful form that grows up to 15 cm year. Originating at our nursery in the Klondike, best in a large planting as a companion to others or as a feature specimen in a sheltered garden space. One of a kind for colour. Not available 2018. Miniature glaucous white spruce with very compact, bun-shaped form and long dense needles. 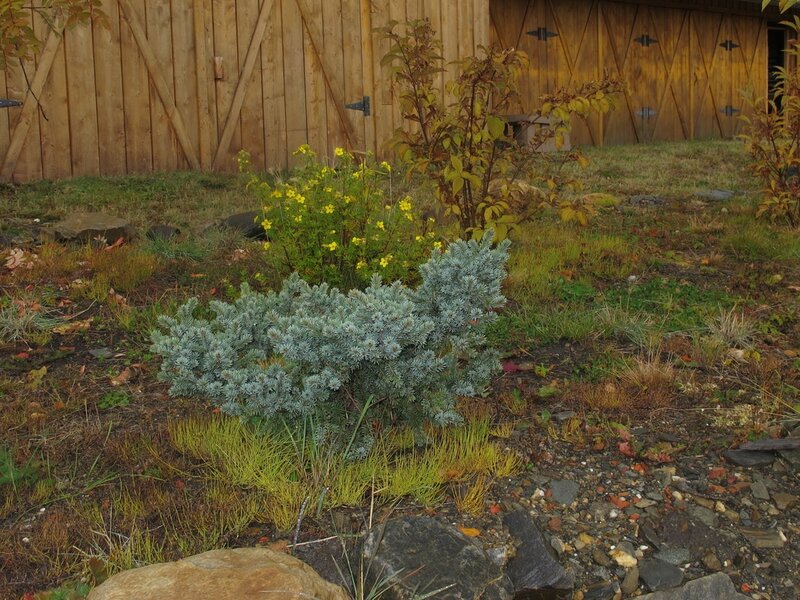 Grow in small gardens or rockeries where grass will not overtake it. No pruning needed to maintain shape or size, benefits from occasional clearing out of dead needles and debris. Grows only 1-3 cm year. Recommended for collectors and serious gardeners. Parent growing in Cowley Lake area. Upright dwarf, informally conic in shape. 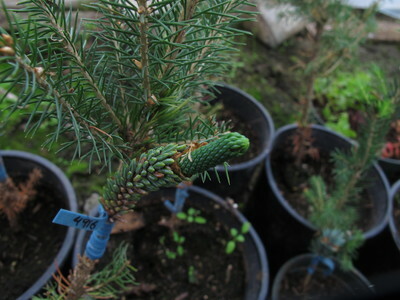 Dark, emerald green white spruce with dense needles. Grows up to 8 cm year and produces dark brown buds. 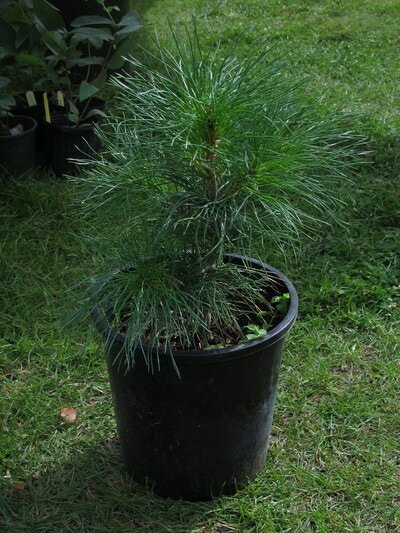 Useful in beds, borders or foundation plantings, use as an accent or small feature specimen. 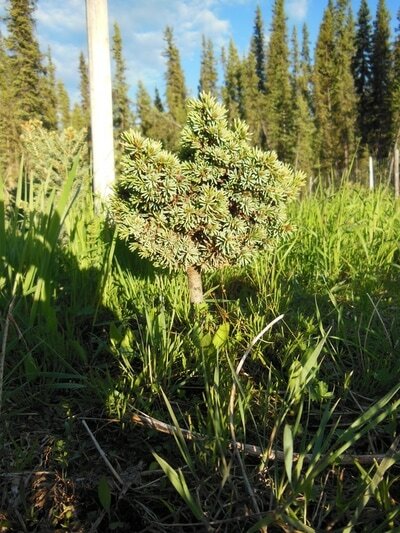 Parent tree discovered near Tatchun creek north of Carmacks, fell in a windstorm in 2012. The best in our collection of compact, fastigate, dwarf white spruces. 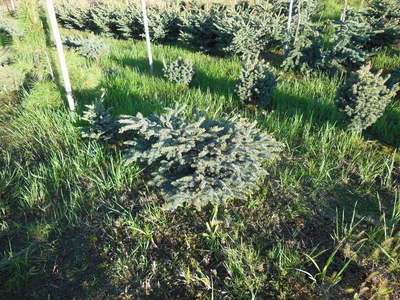 Somewhat columnar with brown buds among a dense display of rich blue-green needles. 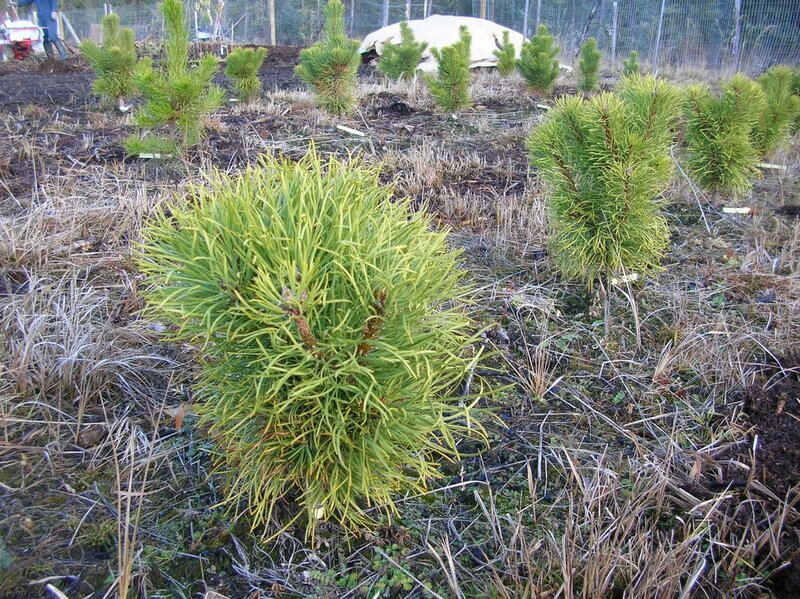 Grows only 5-8 cm year, reaching 30 cm wide and 50 cm tall in ten years. With minimal pruning can form an egg-shaped ball. Much slower growth on a standard (3 cm a year). Some cleaning out of dead needles recommended every few years. Parent resides on the shores of Fox Lake. Unusual low-growing dwarf with distinctive olive green, arching, horizontal growth. Can be used as part of a foundation planting, in a group or as a specimen on its own. Grows 5-8 cm a year. Parent was a 75-year old broom the size of a minivan along the Klondike river, that has since toppled. 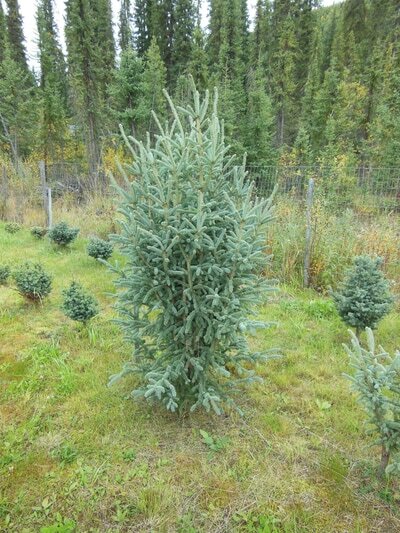 Dwarf white spruce with short, grey-green needles and heavy, round brown buds. 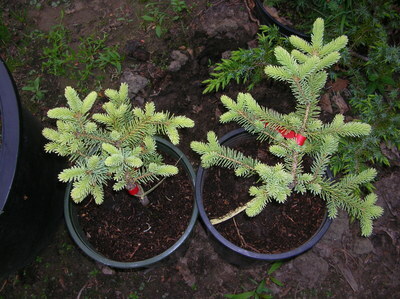 Grows up to 8 cm year. 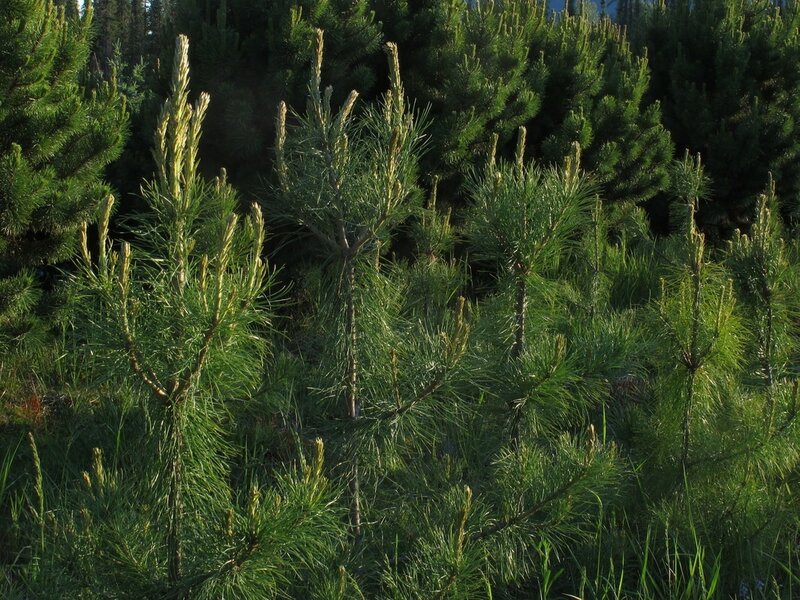 Originates in the Stewart river valley where the parent broom grew like a ten foot rug hanging out the side of a typical spruce tree. 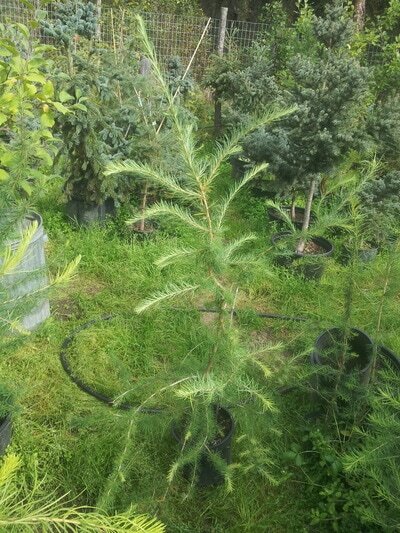 Like many children it does not follow after its parent, instead expressing a round, bushy form with upright growth. 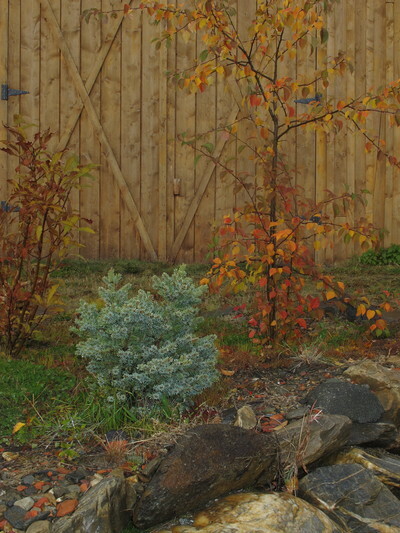 Suited to groups, beds and borders rather than foundation plantings. Our fastest growing semi-dwarf white spruce, reaching a height of 2.5 m in ten years on moist ground. Columnar and fastigate with large orange-brown buds and typical needles. Suited to group or specimen planting where an unconventional stately form is desired. Originates in the Faro region. Semi-dwarf, mid-green white spruce. 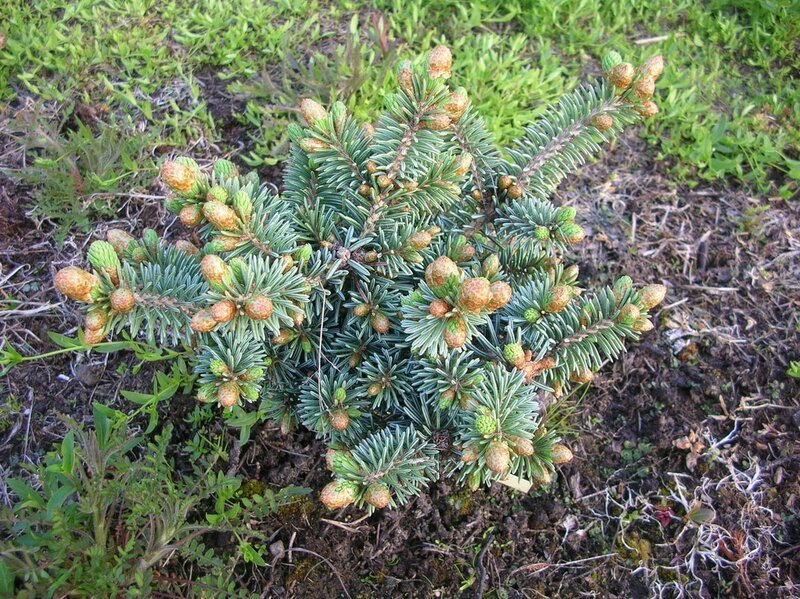 Upright growth in a globose form. 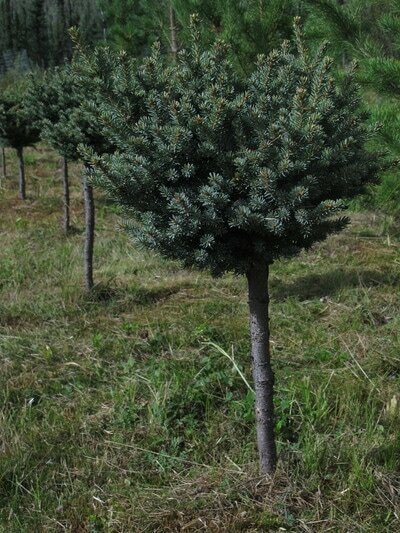 Very consistent, excellent for foundation or group plantings or a dense hedge, growing to 1 meter high in ten years. 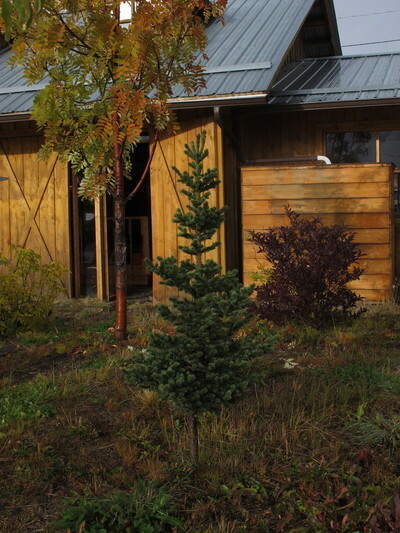 Slower growing and more compact on a standard. Good companion to Skookum Sarah or Minto Fats in a group. Originated in the Klondike Valley. 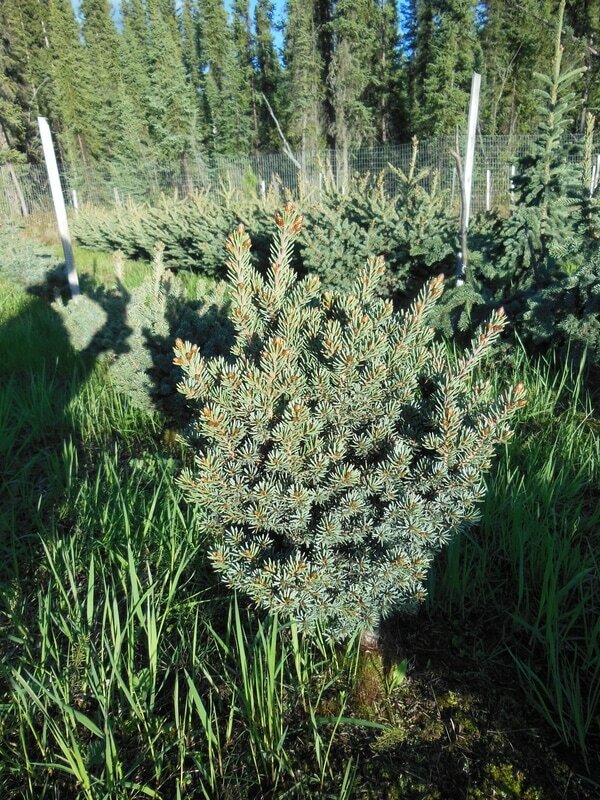 Dwarf white spruce with mid-green stiff needles and prominent gold-brown, round buds. Strongly upright growth (fastigate) within a boxy open form. Grows up to 8 cm year, self-cleaning. More formal or uniform than Emerald rose in outline. 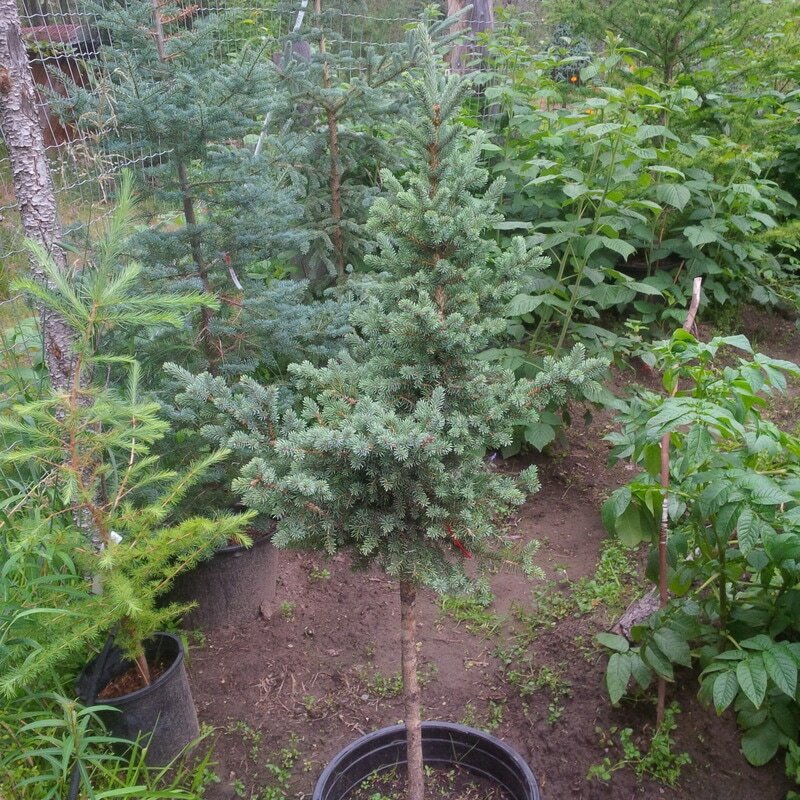 Dwarf, globose, fine-needled white spruce. Light green in colour with numerous gold brown buds. 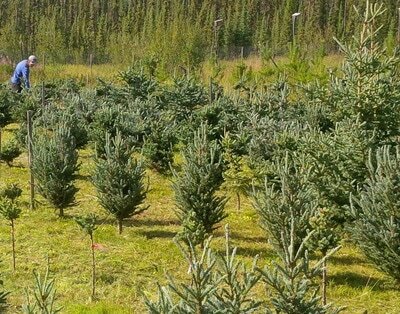 Very consistent, excellent for foundation or group plantings. 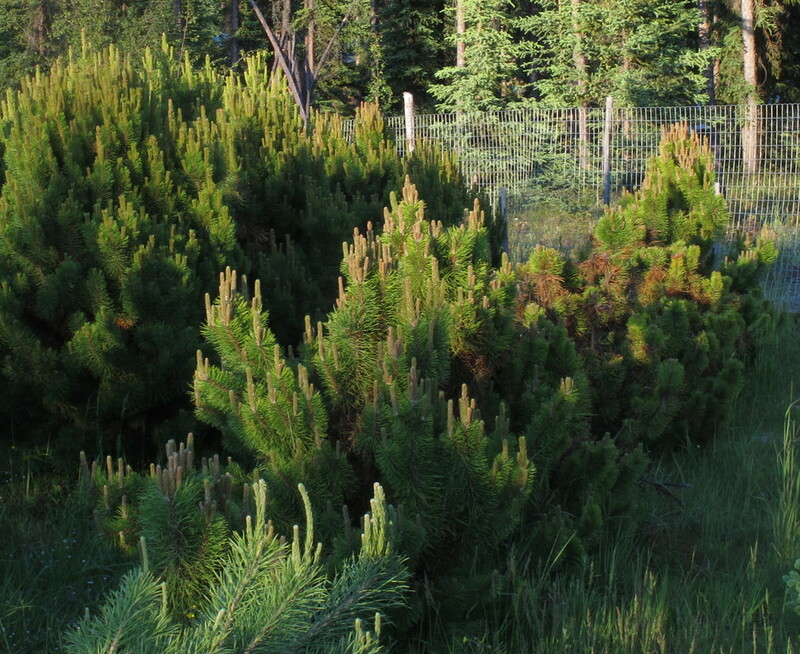 Remains low and wide with no pruning, reaches 1 m high by 1 m wide in 10-15 years. Discovered in the Minto Flats area of Yukon River valley. Semi-dwarf to dwarf. 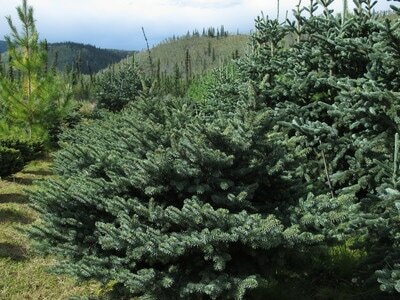 Broad, low-growing glaucous white spruce with very stiff, wide, reflexed needles. Impetuous, responds well to light pruning. 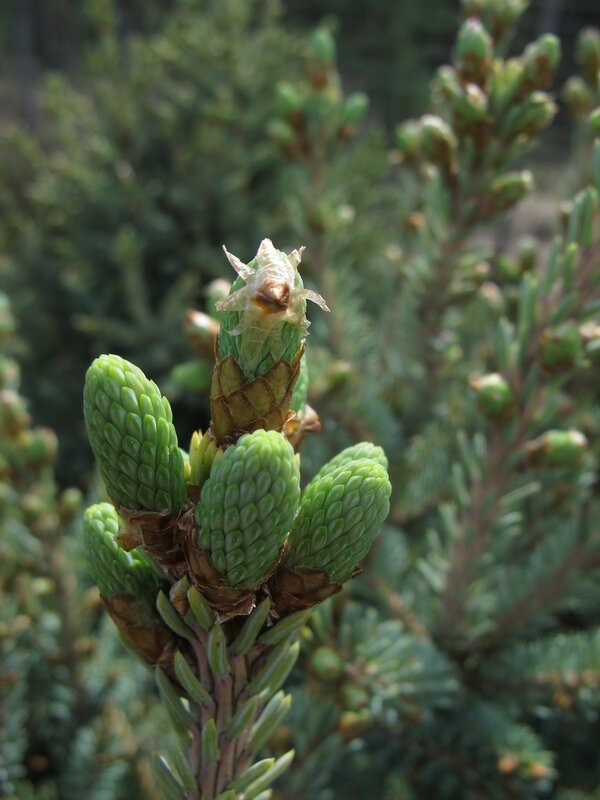 Buds are brown with a hint of pink, very showy. Makes a great dwarf on a short standard. 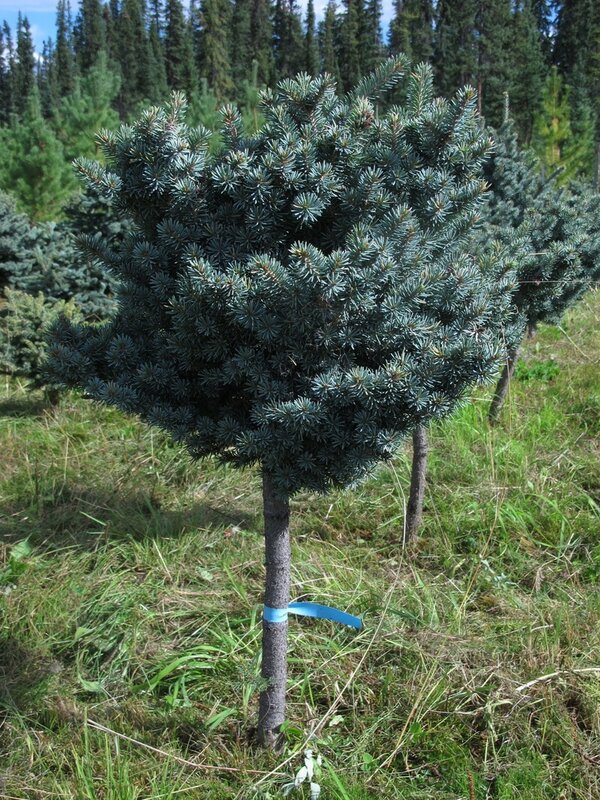 Well-suited to foundation plantings and group settings. 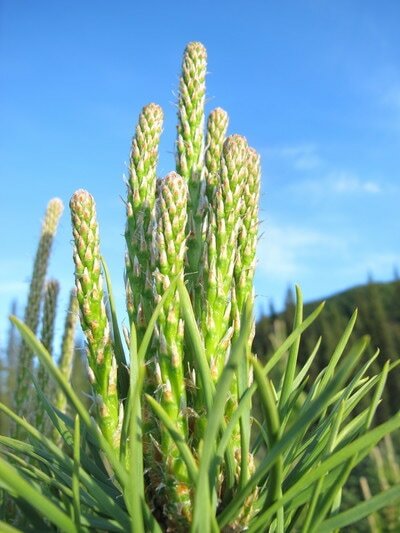 Ground-hugging plants grow 7-15 cm year, 4-8 cm on a standard. Parent a dense basketball-size dwarf growing north of McCabe creek, Yukon. Dwarf to miniature. 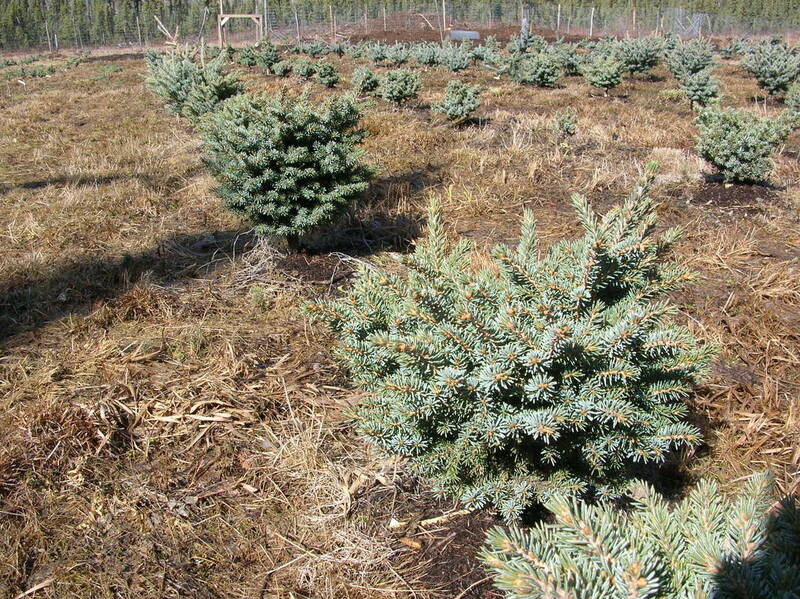 Green, bun-shaped white spruce with fine, short, dense needles. Grows 2-5 cm a year. Numerous small brown buds, very regular form. Use in a small garden or flower bed setting. Little pruning required to maintain formal shape. 70-year old parent the size of a cantaloupe, collected north of Carmacks. 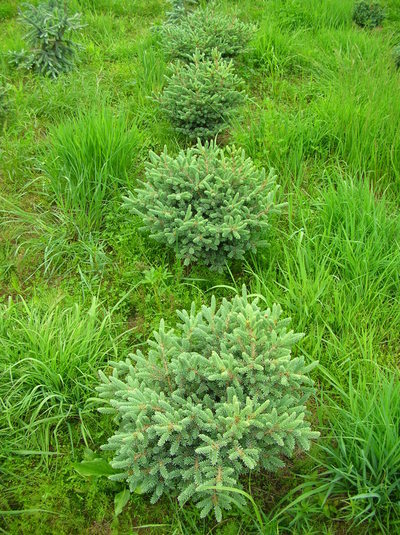 Strong growing semi-dwarf with low wide habit. 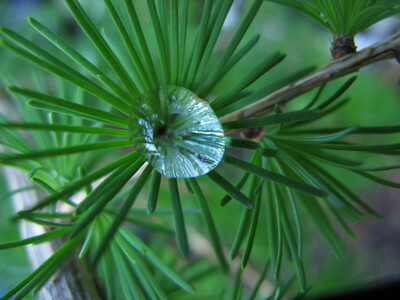 jade-green needles with prominent glaucous stripes. 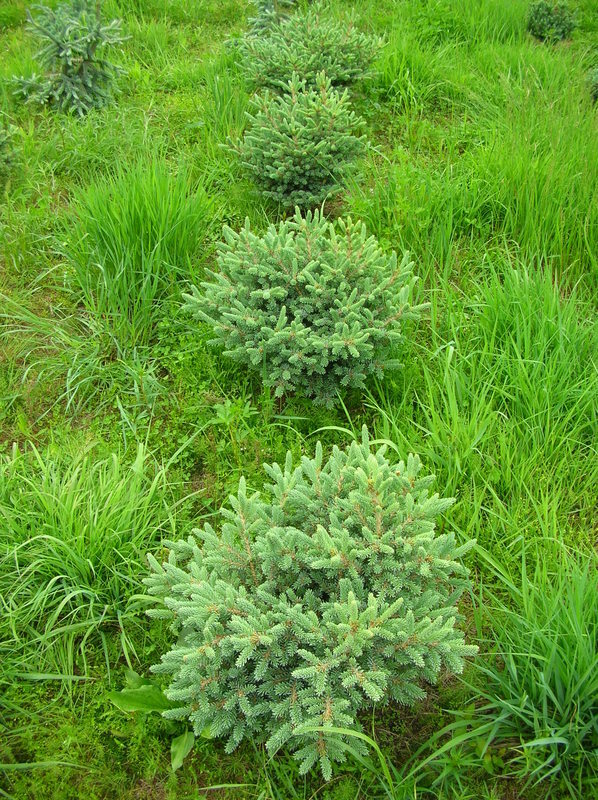 A versatile spruce, great in a foundation planting, in a group or as a specimen on its own. Rugged and adaptable, grows 5-12 cm year. Parent was a fifty year-old, 3 x 2 m broom north of Partridge Creek Farm, destroyed by power line clearing. 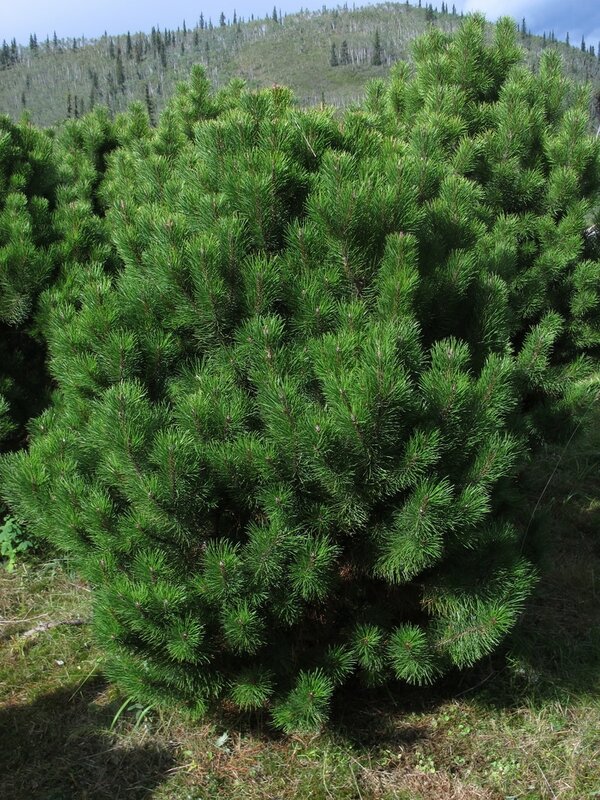 Fine, dense needles that are as soft as a spruce comes cover this dwarf, bright green gem. Reddish brown bark and orange-brown buds contrast to the foliage making it very pretty. Growing only 3-5 cm year, it is as its best in a garden space up close to be thoroughly enjoyed. Another Klondike valley original, the parent is very globe-shaped and over a meter across at 70 years of age. Yukoners call anything out of the territory, particularly south, 'Outside'. That is where these beautiful specimens come from, and we welcome their fortitude in moving north. Choose a literal Exotic (ex - out of, oti - here) to show off the Yukon's inclusivity, and celebrate the qualities that a newcomer needs to thrive. 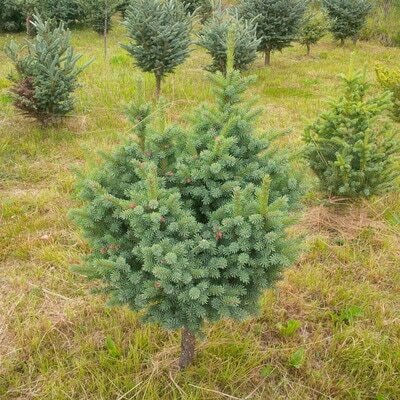 Originating in the Guelph area of Ontario, this popular white spruce grows to be graceful and upright with draping pendulous branches. Standard size, excellent formal specimen. 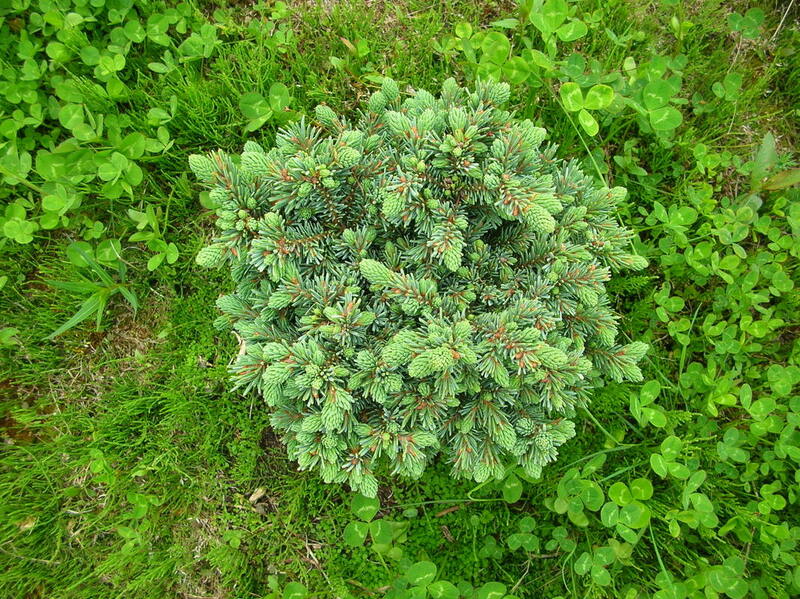 Can grow up to 30 cm a year. 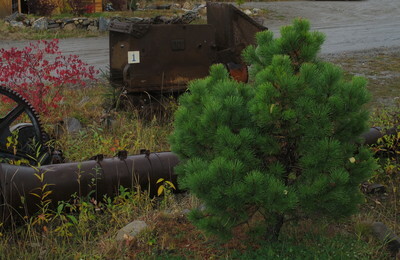 Plant only as far north as Dawson. The best in its class until we find a similar one in the Yukon. Best form is achieved once established in-ground. 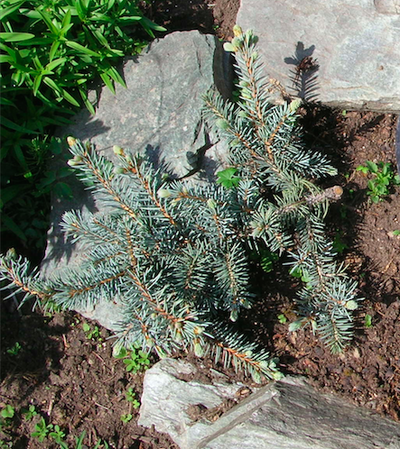 This beautiful prostrate blue spruce flows like waves across the ground. 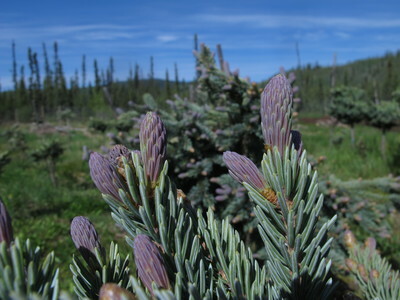 Long, very blue needles, highlighted by baby blue new growth in the spring. 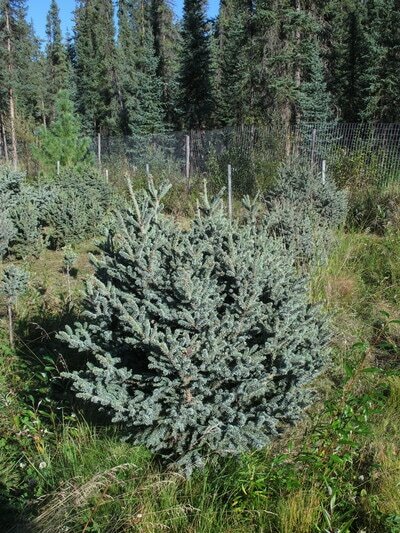 Grows up to 20 cm a year. 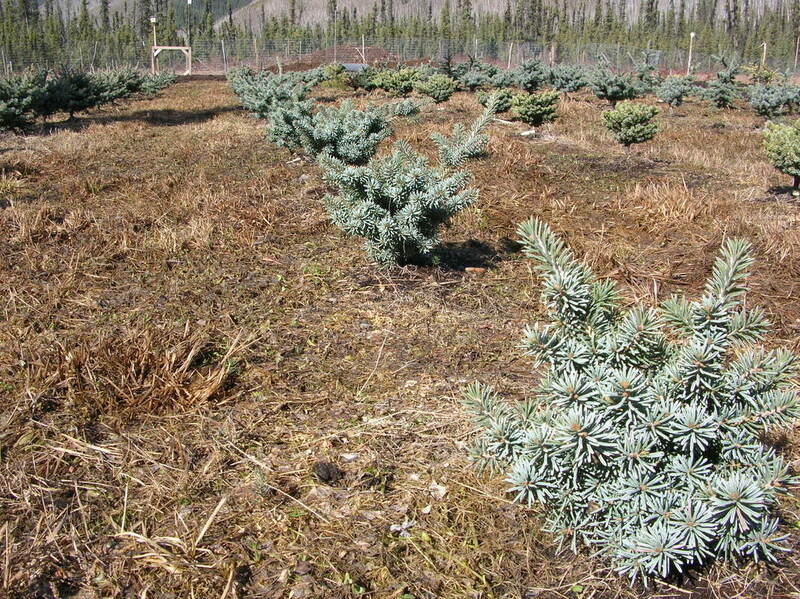 Must have snow cover to look its best in spring. Best in rock gardens and over slopes or stones. We offer 3 exclusive dwarf Lodgepole pines from areas near the BC-Yukon border. All are magnificently full-formed, suited to being accents within a large bed or group planting, or as feature specimens in their own right. These are hardy as far north as Dawson city, and unlike our more northerly Yukon spruce selections, are likely to grow as far south as Prince George or Edmonton. Growing Tip: Clear out dead needles every few years by hand or wash out with a hose in fall. 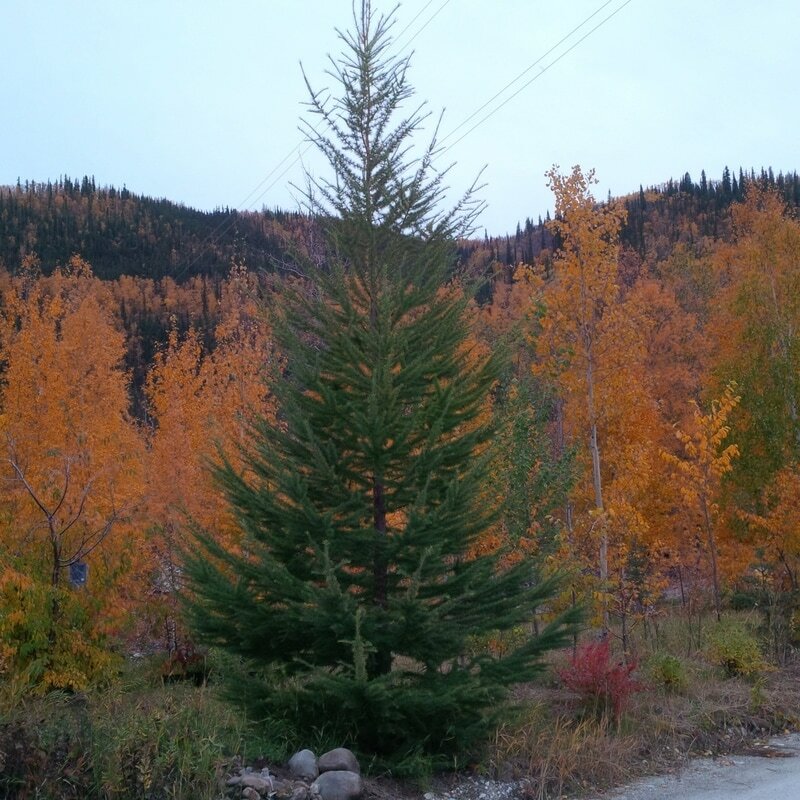 A great dense dwarf lodgepole pine from the Cassiar, BC area, that has grown to nearly 2 meters high in ten years and almost as wide. 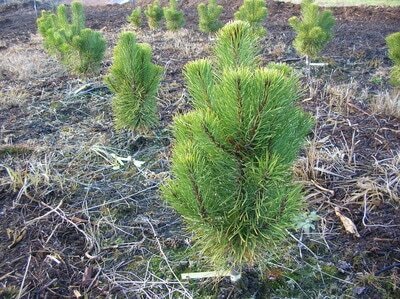 Much more majestic and full- formed than a typical imported Mugo pine. Situate prominently as a specimen or in an open corner to make a statement. Our mid-sized fellow. Stout and full-bellied, Percy is tough and good-looking at nearly 1.5 meters tall in ten years. 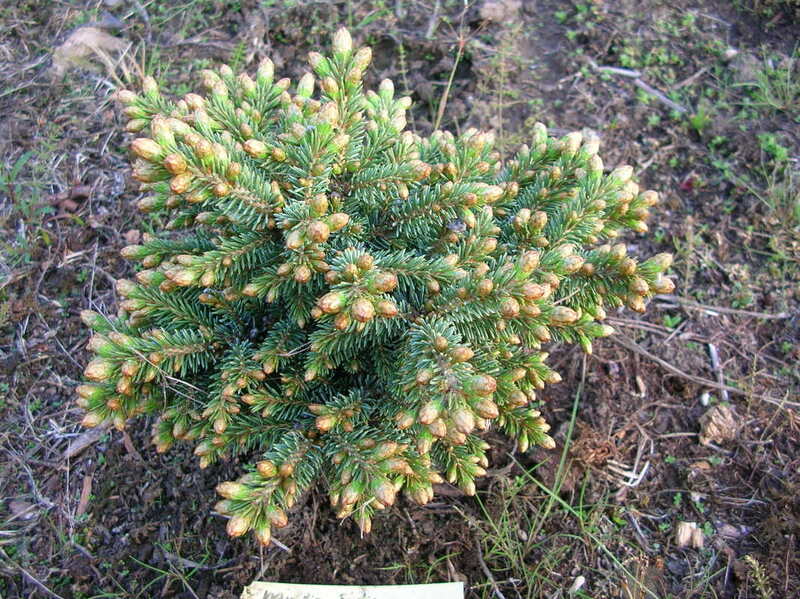 Dense needles contrast with big reddish-brown buds. 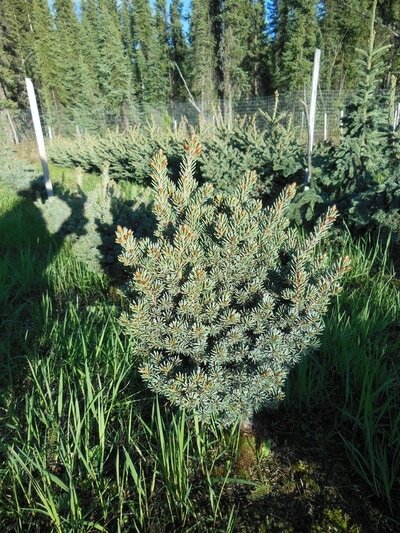 Cultivated from a prominent broom in the Tagish area of southern Yukon. The smallest of the trio, Boya has reached a meter tall in ten years. 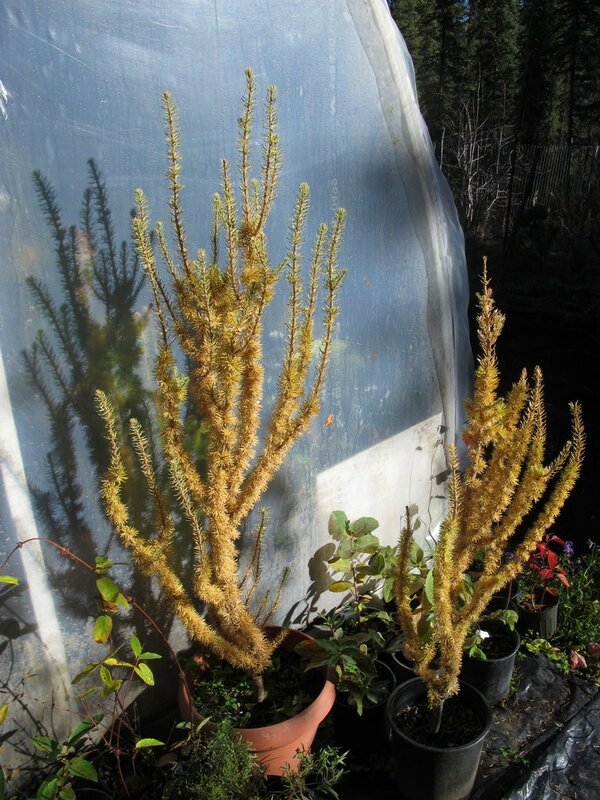 Broad form with with very long needles. 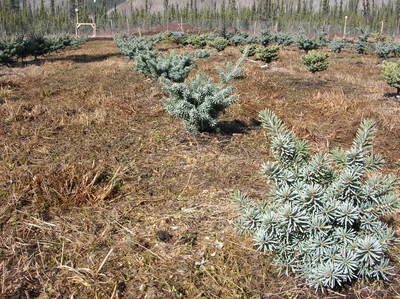 Originates in Northern British Columbia, can be cold-damaged in the central Yukon. 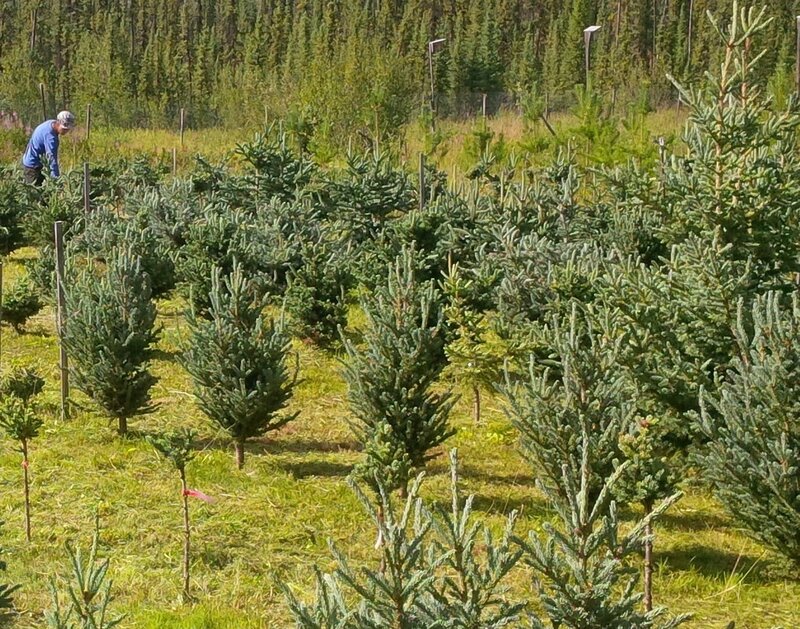 Hailing from Russia, with love, this collection comprises pines and larches well-suited to northern Canada. The airy, feathery larches are the fastest-growing of our trees. Fast growing. Open form similar to our local lodgepole pines but broader with lighter coloured needles and bark. Very tough large trees with green needles in summer and gold to reddish-gold needles in winter. 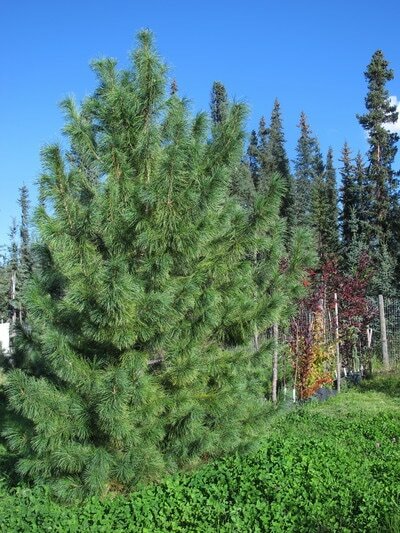 Trees to mark the centuries with, Siberian stone pines can live five to eight hundred years, so give them room - around 20' from any other large trees. Even the lowest branches remain growing over the life of the tree, making mature specimens full-bodied in their natural state. 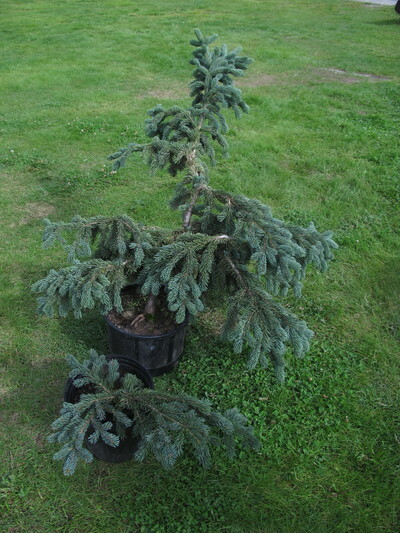 Alternatively, the form can be managed by trimming lower branches to promote a wide high canopy of limbs. 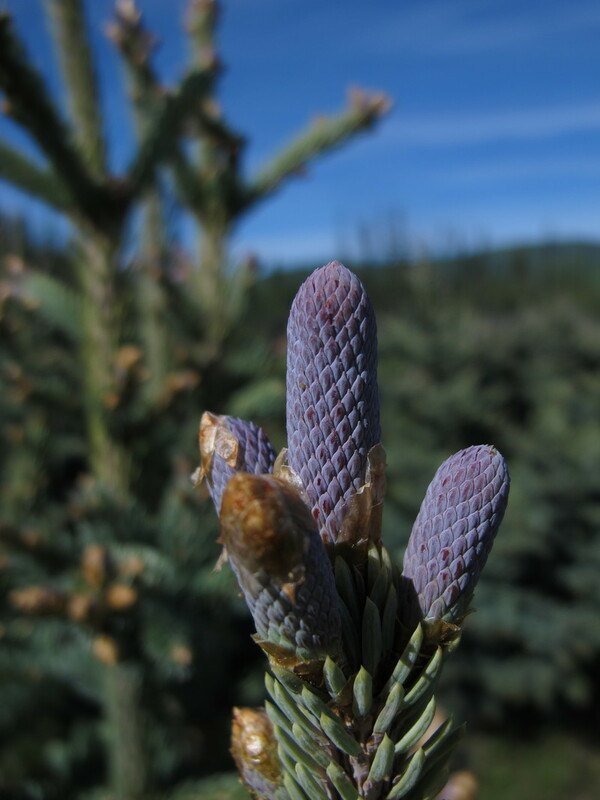 Cones provide pine nuts by approximately fifteen years of age. Plant several if you have this treat in mind. 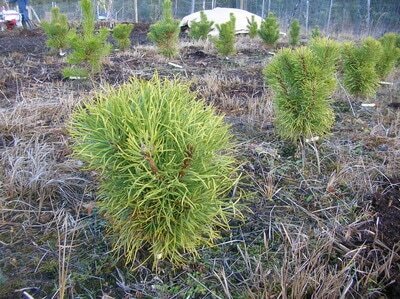 These larches are grown from seed collected from our own mature trees, the first of which we planted here in 1990. 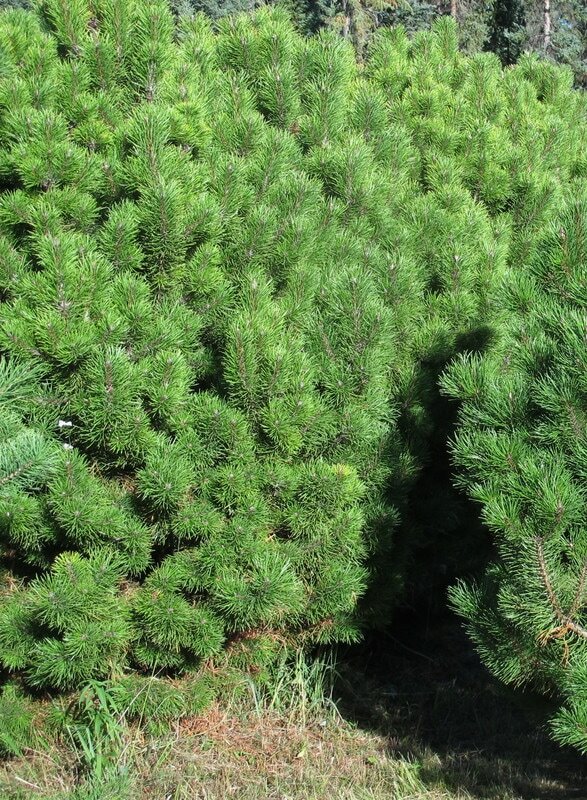 These are the fastest-growing conifers we offer, with rates of 50-75 cm growth each year. 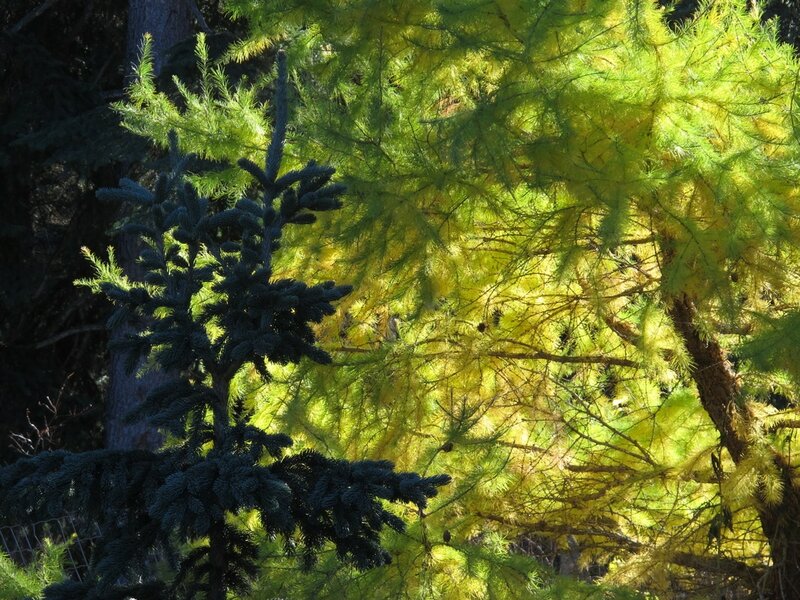 Light green and airy in summer, golden in fall after all other trees have shed leaves and open to light in winter once their needles have fallen. Large and lovely, generally conic when young, becoming more broad with age. Klondike Valley specials, these are exclusive grafted larches we have propagated from favorite selections that have emerged at our Nursery over the years. 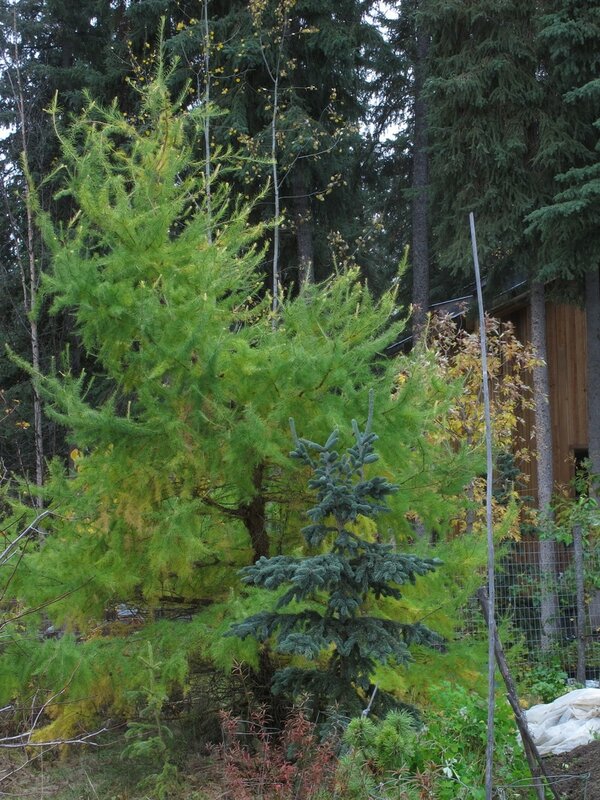 Big, strong Siberian larch with a top that will grow in any direction but straight up. Similarly, the branches sweep out from the swirling trunk as if the tree is in a permanent pirouette. Very unconventional – suited for those who like to dance their way through life. 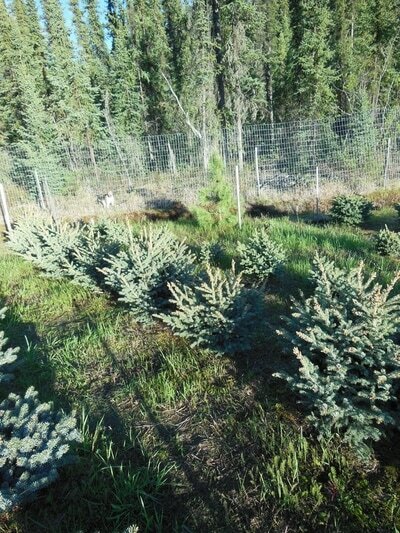 Grows 50-75 cm a year. A slower-growing selection in a strongly upright formal cone shape. Intended for more traditional folks and landscapes, with an appreciation for elegance. Particularly short green needles with a bluish tint. 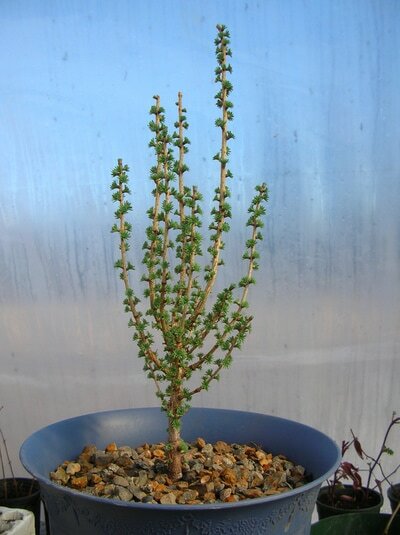 A very dwarf gem with upright, fastigate shoots that branches irregularly. Heavily covered with soft dense emerald green needles. 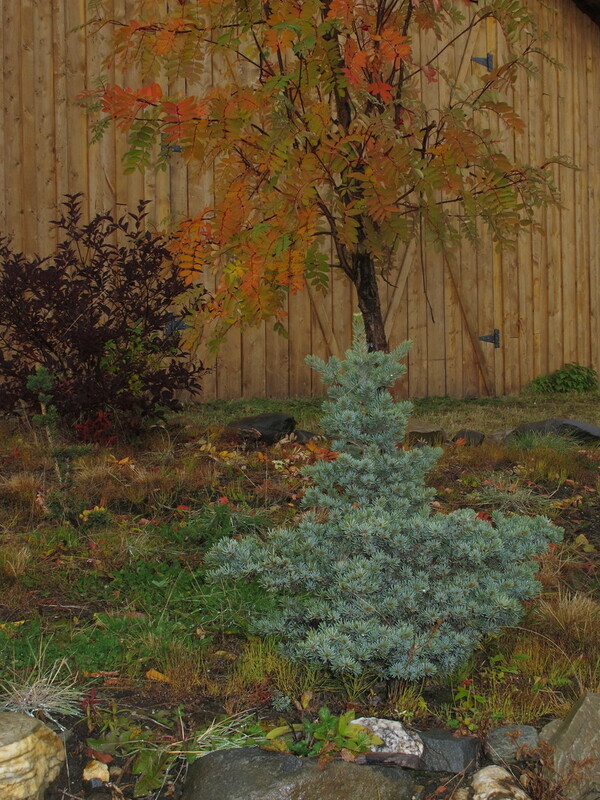 Typical golden fall colour and leaf drop as other larches. 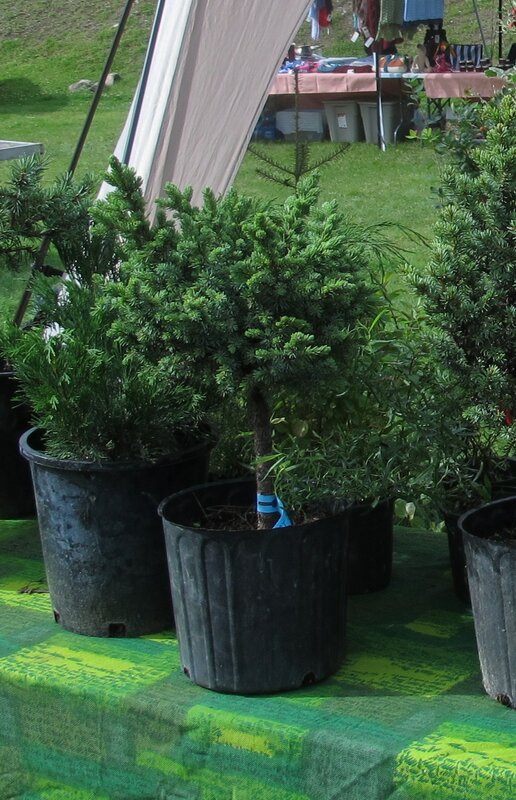 Best suited to small gardens or sheltered site, small enough for container growing.